In the late eighteenth century Penzance was a small town in the isolated county of Cornwall. 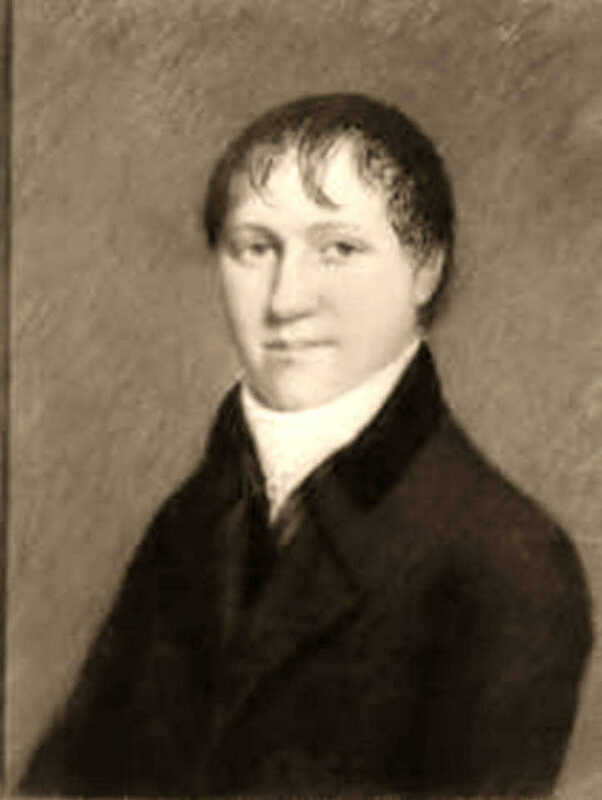 Robert Davy was a wood carver in the town when his first son Humphry was born in 1778, although in 1787 he inherited a 79 acre farm at Ludgvan about 3 miles away. 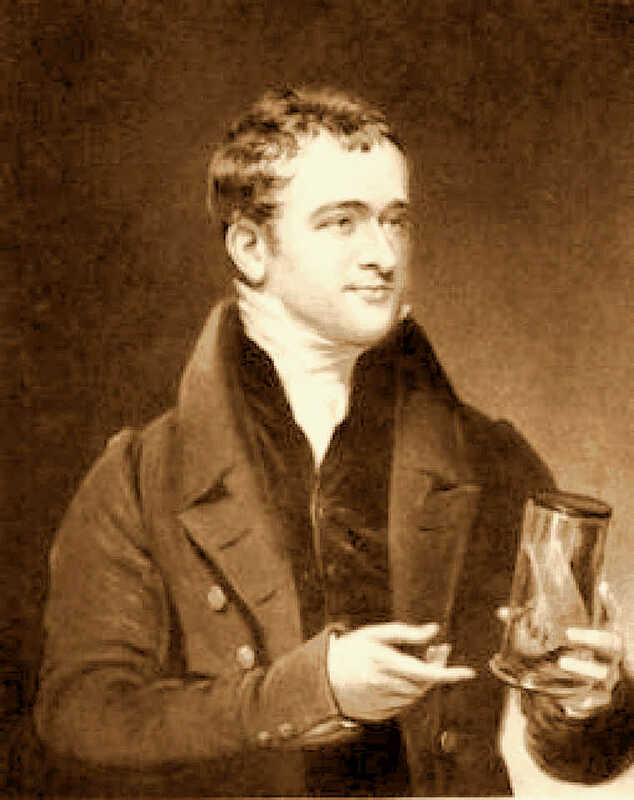 From these humble origins, Humphry Davy rose to become the most celebrated chemist of his era. Humphry Davy was a bright boy with an inquiring mind and thanks to the patronage of the town's apothecary Dr John Tonkin he benefited from a classical education. In his teens a local ironmonger named Robert Dunkin befriended Davy and introduced him to mathematics, electricity and magnetism, and scientific experiment. In 1795 Davy was apprenticed to John Borlase an apothecary and surgeon. As well as his interest in science and his medical studies, Davy enjoyed angling and writing poetry. In 1797 when Davy was eighteen the course of his life was set when he came across Laurent Lavoisier's book 'Traite elementaire de Chimie'. (Davy had learned French from emigres who had fled the Napoleonic wars). Lavoisier was the father of modern chemistry as distinct from ancient alchemy. Davy repeated some of Lavoisier'Traites experiments and his findings were published as 'Young Man's Researches on Heat and Light'. About the same time Davy met Gregory Watt who was recuperating from sickness in Penzance. Watt was the son of the great engineer James Watt and had just come down from Edinburgh University where he had studied chemistry and geology. Watt became a firm friend and introduced Davy to many eminent scientists including Matthew Boulton (James Watt's partner), the chemists James Keir and Joseph Priestley, and one Dr Thomas Beddoes. Dr Beddoes was a prominent physician in Bristol with eminent and wealthy patrons and he proposed setting up a Pneumatic Hospital, where various gases would be administered to treat sickness and hypochondria. He required an assistant and Davy moved to Bristol to take up the appointment in October 1798. Davy lived in Beddoes home in Clifton that was equipped with an excellent laboratory where he could experiment. Among the many social visitors to Beddoes home were the poets Robert Southey and Samuel Taylor Coleridge and both became friends of Davy. Davy established the hospital in Dowry Square where he wrote Ǝ or 10 in patients could be treated and as many out patients as we can procure'. Among the discoveries of Joseph Priestley was a gas he had named dephlogisticated nitrous gas. In 1799 Davy experimented with this gas, eventually producing it in a purer state, and he renamed it nitrous oxide. Inhaling the gas experimentally, he was the first person to note two remarkable effects. First the gas rapidly induced a state of euphoria that gave rise to the common name 'laughing gas'. Second, on an occasion when he had toothache, he recorded the anaesthetic effect of the gas, and in the course of time, nitrous oxide became the standard anaesthetic for carrying out painful dental work throughout the world. Soon Davy, Southey and Coleridge and other acquaintances were using nitrous oxide for recreational purposes. Davy was not yet 21 years old but his name was well known in scientific and social circles. Sir Benjamin Thompson (Count von Rumford), an American with a Bavarian title, founded The Royal Institution in 1800 to promote scientific discoveries and their industrial application. The Institution's splendid laboratory and lecture theatre were ready in February 1801, and Humphry Davy was appointed Assistant Lecturer in Chemistry, and Director of the Chemical Laboratory. His skills as orator and presenter impressed audiences immediately. By 1802 he was Professor of Chemistry at the Royal Institution and soon after Director of the Laboratory. Davy had already discovered improvements for the leather tanning industry in his time in Bristol and in 1803 he read his first paper at The Royal Society on 'Astringent Vegetables and their operation in Tanning'. He gave a course of eight lectures on 'The Relation of Chemistry to Agriculture' and produced a soil testing apparatus for the Board of Agriculture. Honours followed such as Fellowship of The Royal Society in 1803, and Fellow-commoner of Jesus College Cambridge in 1804. 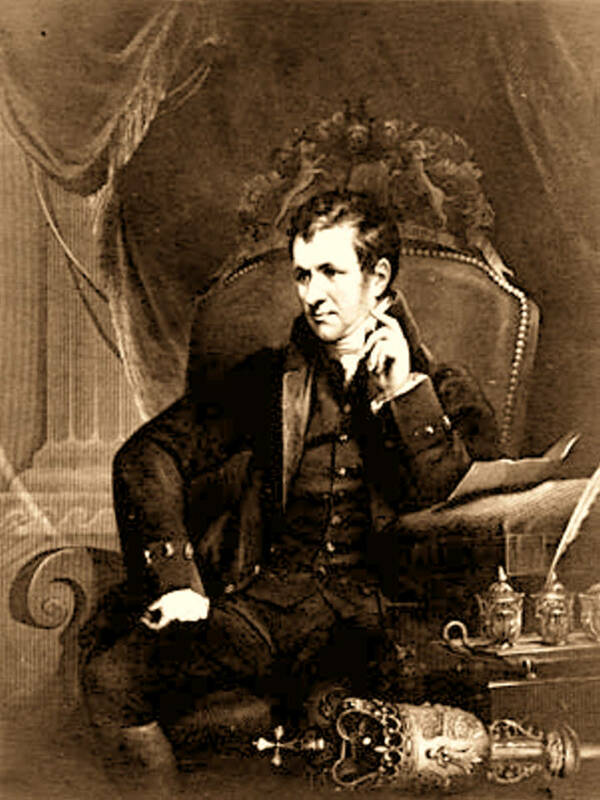 Davy travelled widely to Bristol, to Ireland and to the Lake District where he stayed with William Wordsworth and met Walter Scott. He also enjoyed angling and geological studies on these journeys. Electrolysis of a solution of the alkali potash in water didn't work. 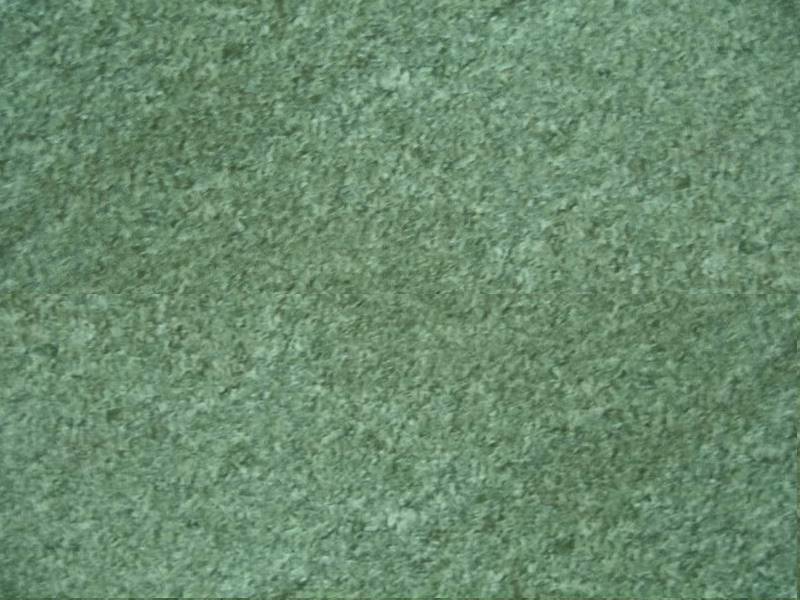 He tried again with dry potash, igneously fused by the application of heat, on a platinum spoon. There were dramatic effects on the spoon, but the potash remained unaltered. Eventually he moistened some potash to make it slightly conducting, and this time the potash was decomposed. Davy had discovered the element Potassium. The experiment was repeated in a vacuum to prove that the decomposition was independent of the air. A few days later he decomposed soda to discover Sodium. These important discoveries were described in the second Bakerian lecture in 1807 and led to many industrial applications. There followed serious illness, possibly the result of inhalation of noxious gases, and during a period of depression Davy turned again to poetry. However Davy's work was recognised throughout Europe and he was awarded the Prix Napoleon even though France and Britain were at war. When Davy recovered, the elements magnesium, calcium, strontium, and barium were all discovered using electrolysis. He also showed that oxygen could not be obtained from the substance known as oxymuriatic acid and proved the substance to be an element that he named chlorine. This discovery overturned Lavoisier's definition of acids as compounds of oxygen. There were profound changes in Davy's life in 1812. He retired from his full time post to become Honorary Professor at the Royal Institution. This gave him more time to follow his interests in research, angling, poetry, travel and a wealthy widow named Jane Apreece. Davy was knighted by the Prince Regent and a few days later married Jane. There were no children and in later years they followed separate interests, but there is no record of either speaking ill of the other. 'The Elements of Chemistry' was his final series of lectures to the Institution. In the audience was a young bookbinder named Michael Faraday who was very keen to become a scientist. Faraday was appointed Davy's assistant with permission to conduct his own experiments in 1813. 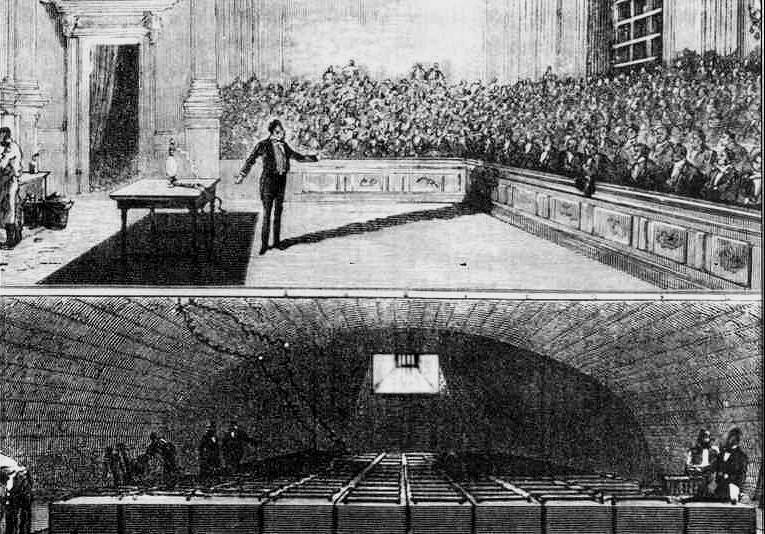 Humphry Davy demonstrates his new electric light for the members of the Royal Institution of London 1809. Power is drawn from the banks of batteries in the basement and rapidly used up by the intense light. Electric light was then only a scientific curiosity, practical only when expense was no object. The Davys planned a European tour, including a visit to France for Davy to receive his Prix Napoleon. Faraday was to accompany them and Davy obtained assurance of safe passage through France despite the continuing wars. In France, Davy met the leading French chemist Joseph Gay-Lussac and the physicist Andre Marie Ampere. Ampere asked for assistance in identifying some mysterious violet coloured flakes. Davy set about the task in his hotel room producing noxious fumes and explosions and identified a new element - iodine. In Italy Davy focussed the suns rays with a lens to ignite a diamond in a globe filled with oxygen. The diamond was reduced to a black dust proving that the diamond was pure carbon. There was also a meeting with Volta. After much socialising, geological study and angling the party returned home in 1815 after nearly two years away. The Davys shortly set out on another social and sporting tour of Britain. While in the north The Society for Preventing Accidents in Coal Mines approached Davy to see what could be done about the explosive gas known as firedamp. By experiment Davy realised that the firedamp required a lot of heat to ignite. He designed an oil-burning lamp in a gauze enclosure that restricted the amount of air and firedamp reaching the flame and limited the heating of the firedamp (1815). 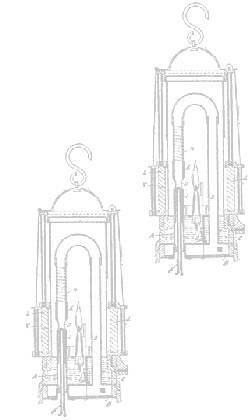 There were rival designs from other inventors, but The Royal Society asserted that Davy was the sole designer of the first safety lamp. Davy refused to patent his lamp, in effect making it a gift to the nation. In 1821 news arrived that Hans Oersted had discovered the magnetic effect produced by an electric current. Faraday took to electrical studies enthusiastically and in time his career became no less illustrious than Davy's. There were suggestions that Davy was jealous of his protege's success, but Faraday never publically disparaged Davy. In 1829 Davy, on one of his European tours, suffered a stroke in Rome. His wife Jane travelled from London to be with him. On the journey home Sir Humphry Davy died in Geneva where he is buried.